Sofiane Si Merabet is a real cultural cartographer. Travel-obsessed and polyglot, Sofiane has always been involved in projects reflecting on Culture. From TheConfusedArab (www.theconfusedarab.com) a newly-launched digital platform, Sofiane explores the “future of nostalgia” concept. The Confused Arab was part of Sikka Art Fair 2017 with the “Hammam Tomorrow’ installation which was also showed in P21 Gallery in London. In 2018, Sofiane continued his creative work on multiple identities and art through “Hawa city” installation in Sikka 2018. 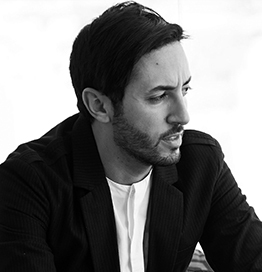 This French-Algerian built his career by leading Marketing for L’Oreal and LVMH between Paris and Dubai and is now heading Karta, a consultancy creative agency specialized in using and leveraging culture to create business opportunities for clients such as Cartier, Gucci, La Cantine du Faubourg and Boston Consulting Group.